Learn how to download and install Ubuntu Linux on Windows 10 in such a way that it won’t harm Windows. Using this method Ubuntu Linux will only run when you tell it to and it doesn’t require any special partitioning of your disks. This installation method requires you to download a piece of software called VirtualBox from Oracle which allows you to run other operating systems as virtual computers on top of your current operating system, including Windows 10. What About Windows 7 and Windows 8 Users? There are also some alternative guides for Windows 7 and Windows 8 users installing Ubuntu Linux. Download Virtualbox by clicking on the large download button in the middle of the screen. To find out whether you are running a 32-bit or 64-bit system click on the Windows start button and search for PC Info. Click on the link for About your PC. The screen that appears tells you lots of useful information about your computer such as the amount of RAM, the processor, and the current operating system. The most important part, however, is the system type which as you can see from the image shows that my system is 64-bit. Using the same technique you can work out which system type your computer is. The guest additions make it possible to run the Ubuntu virtual machine in full-screen mode at a suitable resolution. There are a lot of links on this page. Click on the link that matches the version of Virtualbox you downloaded previously. Press the start button and search for Downloads. Click on the link to the Downloads file folder. The Virtualbox setup wizard will begin. Click Next to start the installation. There is absolutely no reason not to choose the defaults unless you want to choose a different installation location in which case click on ​Browse and navigate to where you want to install Virtualbox. A warning will appear stating that your network connection will temporarily be reset. If this is a problem to you right now then click No and come back to the guide at a later stage otherwise click Yes. You are finally at the point of installing Virtualbox. Click the Install button. A security message will appear asking whether you are sure you wish to install Virtualbox and halfway through the install you will be asked whether you want to install the Oracle Universal Serial Bus device software. Click Install. You can start Virtualbox simply by leaving the Start Oracle VM Virtualbox after installation checked and clicking Finish or for future reference click the Start button and search for VirtualBox. Click on the New icon on the taskbar. Give your machine a name. It is a good idea to go for the Linux distribution name (i.e. Ubuntu) and the version number (14.04, 15.04, 15.10 etc). Select Linux as the type and Ubuntu as the version. Make sure you choose the correct version based on whether you have a 32-bit or 64-bit machine. The minimum you should consider assigning to Ubuntu is 2 gigabytes which ​are 2048 MB. The more you can give the better but don’t go overboard. As you can see I have 8 gigabytes of memory and I have assigned 4 gigabytes to the Ubuntu virtual machine. Note that the amount of memory you set aside is only used while the virtual machine is running. Slide the slider to the amount you want to assign and click Next. After assigning memory to the virtual machine you now have to set aside some hard drive space. Select the Create a virtual hard disk now option and click Create. There are a number of different hard drive types that you can choose from. Choose VDI and click Next. The fixed size option allocates all the space you request straight away. This is less efficient in terms of disk space usage because you may have set aside space you never actually use but it is better for performance. This is the better option as your computer generally has more disk space than memory and CPU power. Finally, you are at the stage of setting how much space you wish to give to Ubuntu. The minimum is about 10 gigabytes but the more you can spare the better. You don’t have to go overboard though. If you are just installing Ubuntu in a virtual machine to test it out go for a smaller amount. When you are ready click Create to continue. This is the point where you need to choose the Ubuntu ISO file you downloaded earlier. Click on the folder icon next to the Host Drive dropdown. Navigate to the download folder and click on the Ubuntu disc image and then on Open. Click on the Install Ubuntu option. A list of pre-requisites will be displayed. Basically, you need to make sure your machine has enough power (i.e. plug it in if you are using a laptop), has over 6.6 gigabytes of disk space and is connected to the internet. Check the install third party software option as it will allow you to play MP3 audio and watch Flash videos. The next step lets you decide how to install Ubuntu. As you are using a virtual machine select the Erase disk and install Ubuntu option. A message will appear showing you the changes that will be made to your disk. Again this is only your virtual hard drive and so it is safe to click Continue. You may find that the correct layout has already been chosen but it isn’t, try clicking on the Detect Keyboard Layout option. Enter your name into the box provided and give your virtual machine a name. As it is a virtual machine you may as well go for the Log in automatically option but we recommend always selecting the Require my password to log in. An option will appear asking you to choose which disk to insert into the optical drive. Click on the Choose disk button. Navigate to the downloads folder and click on the VBoxGuestAdditions disc image and select Open. Right-click on an empty space where the list of files are and choose open in terminal. Finally, you need to reboot the virtual machine. You will be given the choice to restart or shutdown. Choose Restart. When the virtual machine restarts choose the View menu and select Full-Screen Mode. Congratulations! 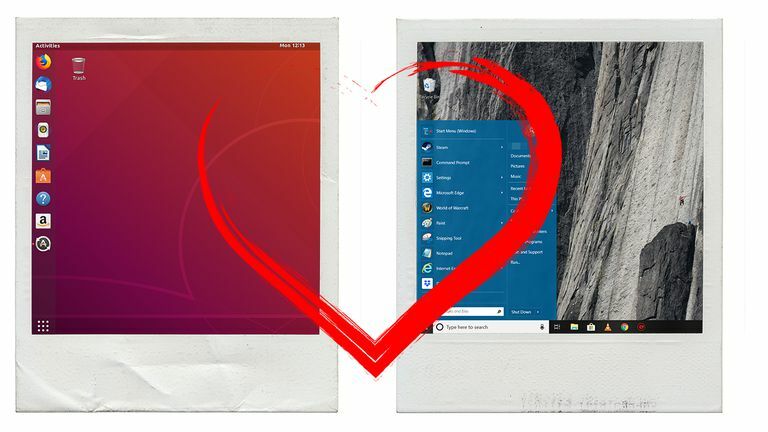 You should now have successfully installed Ubuntu as a virtual machine on Windows 10.